Even more sinister, the game’s reach is large and ever growing: Less than a week after its launch, Esquire claims that it’s already more popular than Tinder, and it’s poised to overtake Twitter (at least when it comes to daily active users on Android) any day now. Basically, if Pokémon Go gains artificial consciousness and decides that humanity is threatening the digital lives and freedoms of its Poké-comrades, we’ll be fighting in Poké-pits for the amusement of our Poké-lords in no time. There’s already evidence that the artificial intelligence hereby known as Pokénet has no respect for human life or morality. This morning, The Washington Post ran a story imploring tourists and Washington, DC residents to please not play Pokémon Go in the United States Holocaust Memorial Museum. 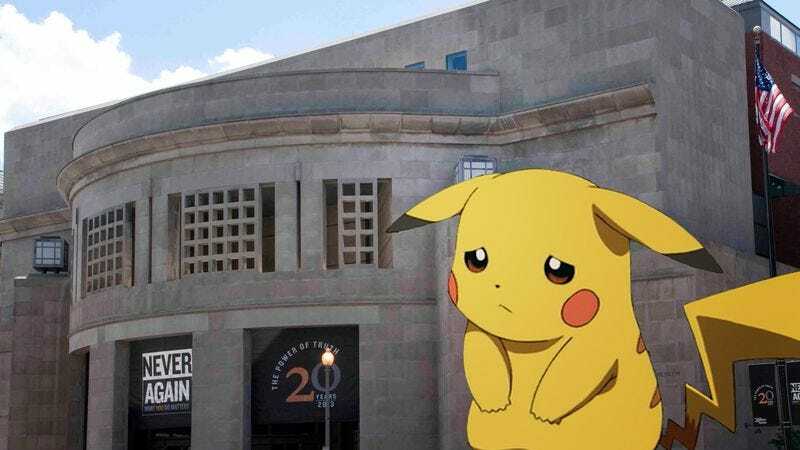 Apparently, the museum—like a number of landmarks not only in DC, but all over the country—is a “PokéStop” where players can catch Pokémon amid sobering reminders of the evil humankind can do. There are three PokéStops inside the museum, including a poison gas Pokemon named Koffing supposedly found outside the Helena Rubenstein Auditorium, where visitors can watch educational films on subjects like, oh, the poison gas chambers that were used to exterminate millions of Jews in Nazi concentration camps. Tasteless coincidence, or foreshadowing of the anti-human uprising still to come? Considering the original Imgur post has since been deleted, the answer to this one may be more mundane than that: A simple bad joke. In the meantime, though, there will be more people like “Angie,” who told the Post’s reporter that “It’s not like we came here to play … But gotta catch ‘em all.” Whether humanity is worth saving remains an open question.